A group of Bristol Bay fishing boats, including Ronn Griffin's Holloway, take a rare break from fishing to rest on the river bank in Egegik, Alaska, in 2015. 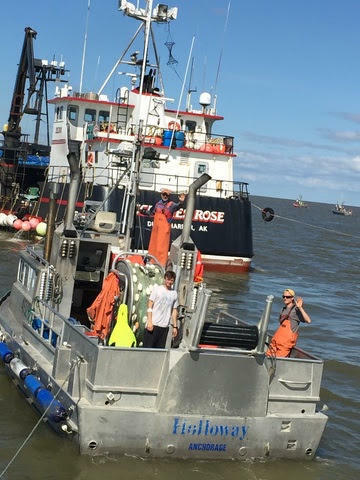 Seattle Bristol Bay fisherman Ronn Griffin's boat, The Holloway, with son John Griffin driving in 2016. The battle over the so-called Pebble Mine has gone on for more than a decade. It was on hold in 2014, after then President Barack Obama’s Environmental Protection Agency found that its plans to extract copper, gold and molybdenum would have adverse effects on salmon spawning areas. Now, after withdrawal of the Obama-era restrictions, a revised proposal is under review by the Army Corps of Engineers. A 90-day public comment period on the draft environmental impact statement began March 1. Many opponents of the proposal say that’s not long enough. “We had 60 million fish return to Bristol Bay last year, in probably a 30- to 40-day period of time. You just don’t have that anywhere else to speak of anymore,” said Ronn Griffin, who lives in Kingston and has been fishing Bristol Bay for more than 35 years. He’s part of the growing chorus criticizing what they say is a fast-tracked and incomplete permitting process under Trump’s Army Corps of Engineers. Hundreds here are demanding an extension of the comment period past May and that at least one public hearing be held in Seattle, not just Alaska. “Seattle has a long history and a vested interest in what happens in Bristol Bay,” Griffin said. Holloway with crew (Ronn on Flyway, sons John (r) and Ryan (l) on deck) in tender delivery line. "A good day - you can tell by how low the stern is in the water." says Ronn. In 2012, the EPA held a hearing on the Pebble Mine here, at the request of Washington Sen. Maria Cantwell. Cantwell puts the value of the fishery at $1.5 billion annually and has again called for a Seattle hearing. Bristol Bay has the last pristine salmon runs in the world — the largest for sockeye. And though it’s thousands of miles from Western Washington state, people here are concerned. Elizabeth Herendeen is with the Businesses for Bristol Bay Coalition. She says they’re demanding the permitting process be put on hold because crucial information is missing. “This decision, that the Army Corps makes, will not just have long-term impacts on Bristol Bay and those communities, but Washington state as well. And there’s no reason to not have a public hearing in Seattle,” Herendeen said. Nearly 800 salmon fishermen in Washington have permits for Bristol Bay. The Businesses for Bristol Bay Coalition was launched in 2017 with the help of outdoor recreation outfitters, seafood companies and Seattle restauranteur Tom Douglas, among others. They want the preservation of fishing jobs, which they call “renewable” because they will last as long as the resources do in Bristol Bay and support all kinds of other, related industries. And, Griffin says, it stands in stark contrast to so many salmon runs in Washington that are suffering because of all the development around them. Though it’s thousands of miles away, a proposed mine for gold and copper in Alaska’s Bristol Bay threatens to destroy the livelihood of thousands of people in the Puget Sound area. Seattle’s fleet of commercial fishermen and seafood processors have been a big part of the opposition to the so-called Pebble Mine. A new economic report puts the value of Bristol Bay’s salmon at $1.5 billion per year, and says more than a quarter of the jobs it generates are located in Washington state. It was standing room only at the federal building in Seattle, where the Environmental Protection Agency held its first hearing Thursday on Alaska’s Bristol Bay fishery. At issue is the potential effects of a proposed gold and copper mine there. The assessment looks at mining in general, though concern has arisen over a huge project known as the Pebble Mine. DILINGHAM, Alaska – Environmentalist groups are celebrating a victory in a remote corner of southeast Alaska. Residents near Bristol Bay have voted to try to block one of North America's largest open pit mining operations. It's proposed for a spot next to one of the world's most productive salmon fisheries. It’s thousands of miles away, but supporters of a campaign to stop a controversial mine proposal in Alaska say it would harm more than just the pristine ecosystem where it’s located. They’re launching a “Save Bristol Bay Road Show” in Seattle tonight, claiming the city’s fishing industry could lose thousands of jobs if the mine is built. 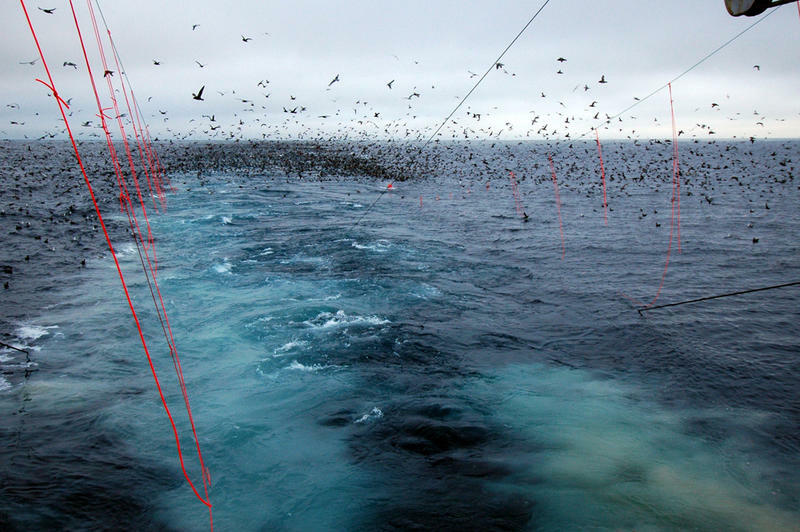 When commercial fishermen spool out long lines in pursuit of sablefish— better known to consumers as black cod—seabirds looking for an easy meal dive to steal the bait off the series of hooks. Some unlucky birds get hooked and drown as the line sinks to the deep. And when the drowned bird is an endangered species such as the short-tailed albatross, it triggers scrutiny.